Randy Alcorn’s ProLife Answers to ProChoice Arguments is a book I’d like to have on hand at all times. I think it should be required reading in high schools and in university ethics, journalism, public policy, and women’s studies classes. I cannot recommend it highly enough. Divided into sections by type of argument, it takes every common pro-choice statement or question and lays out all of the counter arguments. Alcorn doesn’t shrink from his subject matter, but his tone is calm and rational, not hectoring. He relies on a commendable variety of sources; the book contains 789 citations including both pro-life and pro-choice literature, secular media, congressional testimony, and personal conversations with former abortion providers. 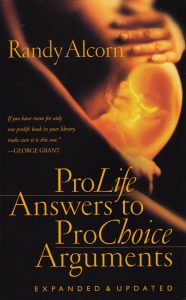 The last section of the book contains a variety of further resources – appeals to different groups of people affected by, supportive of, complicit in or working against abortion, a section on finding forgiveness after abortion, a list of pro-life resources, sections on chemical abortions and birth control, biblical passages and a bible study lesson on life issues, ways of giving practical help to the unborn and their mothers, ways of communicating the pro-life message, and a sermon and position statement on the sanctity of life that he delivered at his church. Alcorn is a former Protestant pastor and, now, a writer and the founder and director of Eternal Perspective Ministries. In the book, he makes clear his background, beliefs and pro-life activities. He augments some of his arguments with his own experiences, but never substitutes subjective arguments for factual ones. I have only two caveats about the book, and they are hardly even that. First, being American, the book refers to American laws, statistics and resources, though I noticed one Canadian pro-life organization in the resource list. That takes nothing away from the usefulness of this book to Canadian pro-lifers, but it would be great to have a Canadian edition with a list of Canadian resources. Second, the book is difficult to read all at once because the subject matter and some of the information can be depressing. Of course, as the introduction states, it is not meant to be read straight through, but rather to be used as a reference. All things considered, ProLife Answers to ProChoice Arguments is an excellent resource for everyone – those who may not have considered life issues at all, those who may have questions, and those who thought they had all the answers, whether pro-life or pro-choice. This entry was posted in abortion, apologetics, review and tagged abortion, apologetics, by Kate, ProLife Answers to ProChoice Arguments, Randy Alcorn, Resources, review on January 18, 2012 by uOttawa Students For Life.